Pearls IC® / 90 caps - Nature's Way®. What is the outer coating of the Probiotic Pearls® Complete made of? Why does Probiotic Pearls® Complete active cultures contain only 1 billion bacteria? Some other probiotic supplements contain several billion. Our company offers many different probiotics in different amounts to suit different needs. Probiotic Pearls® Complete offers 1 billion cfu, the general daily recommendation, in a tiny pearl-shaped capsule. This amount confers health benefits because the probiotics are protected from heat, moisture, and stomach acid so they can arrive intact in the intestines. What makes Probiotic Pearls® Complete a unique probiotic? 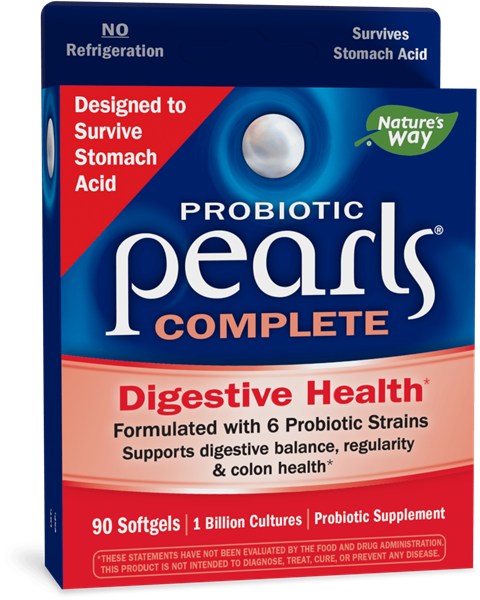 Why would someone take Probiotic Pearls® Complete instead of Acidophilus Pearls™ active cultures?